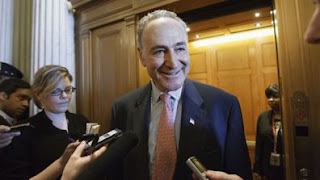 As Republicans call for a domestic drilling surge to counter rising gas prices, Sen. Chuck Schumer is leading a charge on the Democratic side to tackle the country's energy woes with pumped-up production overseas. The New York senator earlier this week wrote a letter to Secretary of State Hillary Clinton urging her department to convince Saudi Arabia to increase production. "While Iran plays games with oil production to punish the international community for holding them accountable for their rush to develop nuclear weapons, Saudi Arabia has the capacity to blunt Iran's influence by increasing its production levels to capacity," Schumer said in a written statement. Republicans, though, have been quick to assail Schumer's idea. Both parties have stressed the importance of weaning the U.S. off foreign oil. Rep. Kevin McCarthy, R-Calif., said the latest call to seek Saudi assistance is "wrong." "Why doesn't he start urging the president to start producing it here in America?" McCarthy said. "Not only can we produce it and lower the price -- we can create jobs, what this country desires. They are wrong." McCarthy and other Republicans have pressed the Obama administration to make approval of the entire Canada-to-Texas Keystone pipeline a first order of business, in addition to opening up new areas of Alaska and the Gulf of Mexico to drilling. The administration, though, has staunchly defended its record on seeking energy independence. President Obama has said there is no "silver bullet" to deal with the short-term problem of rising gas prices - now at a national average $3.74 a gallon. According to the Energy Information Administration, U.S. dependence on foreign oil has declined since its peak in 2005. The agency estimates that the U.S. now imports about 49 percent of its petroleum, with about a quarter of that coming from Canada. About 12 percent comes from Saudi Arabia. The American Petroleum Institute, though, estimates that the percentage of petroleum imports is actually at about 57 percent as of December, slightly higher than it was a year earlier. Regardless, Schumer's office defended the senator's call for more Saudi production. "(Republican critics) are being obtuse," Schumer spokesman Brian Fallon said. "Nothing being proposed by the Republicans would bring relief to consumers at the pump as quickly as the Saudis stepping up exports to offset the effect created by Iran." Schumer's letter to Clinton noted that Saudi Arabia is averaging about 10 million barrels of oil a day, short of its 12.5-million-barrel capacity. "These lower production levels have a negative impact on global markets," he wrote. Schumer went on to warn that Iranian threats and interventions have shaken the markets and could end up harming the American economic recovery, suggesting immediate action by the Saudis could offset that impact. Meanwhile, other Democrats have started to call on the Obama administration to release oil from the nation's Strategic Petroleum Reserve. Rep. Ed Markey, D-Mass., said the country needs to "protect American consumers" from Iran's saber-rattling by releasing the oil. The Obama administration has not said whether it would consider taking that step, though it did so last summer.